One important component of any grill is the thermometer. 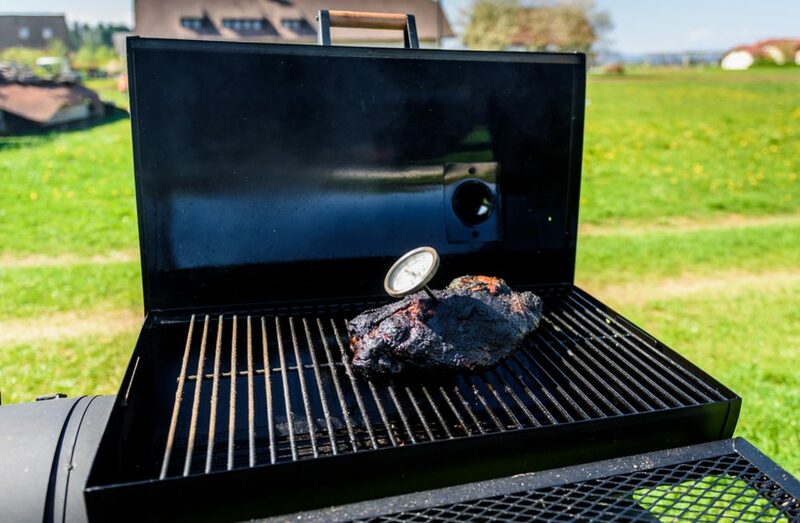 The thermometer allows you to keep track of the heat while the lid is closed so you don’t burn your meat. 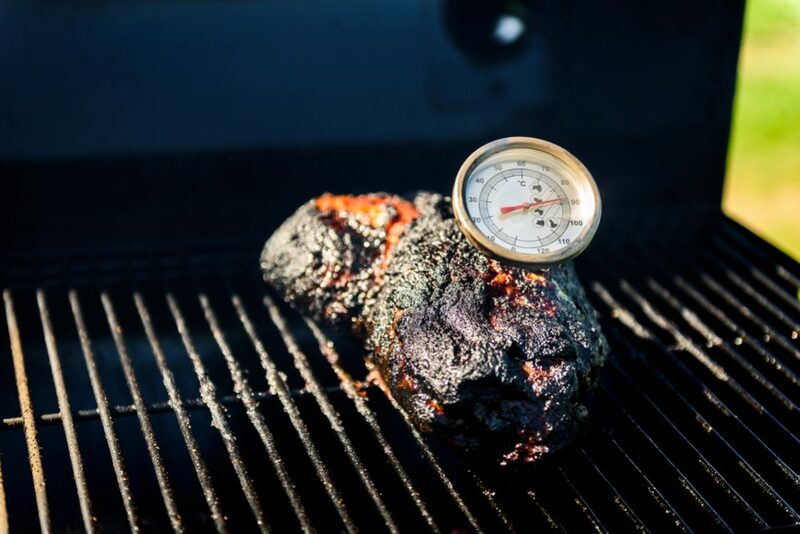 When it comes to purchasing a new thermometer for your grill, you want it to be the best smoker thermometer. This thermometer is the best thanks to its one stand out quality; Bluetooth connection. You can connect this thermometer to your phone and keep track of your meat while still enjoying your time with family and friends. This purchase also comes with an LCD display that you can keep nearby the grill. This allows you to easily turn and see the temperature of your grill. The display screen swaps between the two probes you have in the grill. When your thermometer is connected to your phone, you can set your own personal timings and pre-heated settings for your favorite meats. The perfect product does not come easily. It takes a keen eye and some general understanding to first identify what it is you’re looking for. Nowadays, most grills to come with a pre-installed temperature gauge for when you’re hovering over the grill. 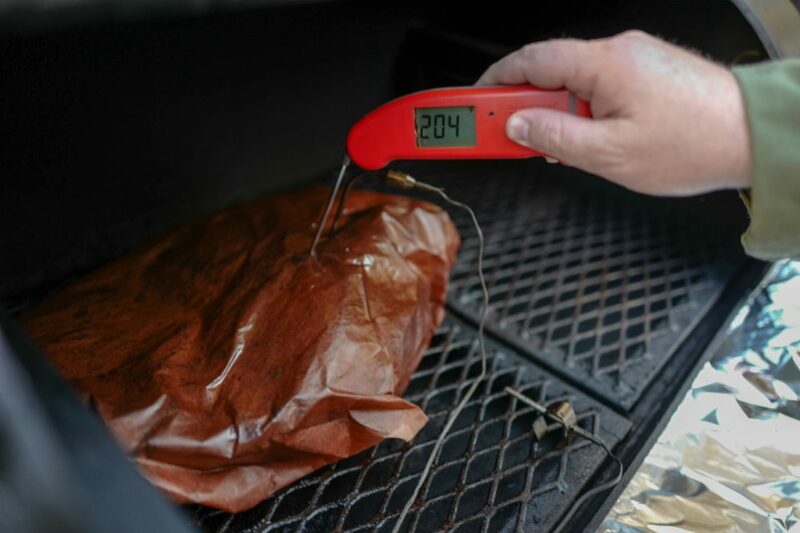 With an additional smoker thermometer, you can not only keep an eye on the grill, but the meat’s actual temperature in the moment. With probes, you can prop them near and in the meat. These probes will keep an eye on the temperature and the display screen will show you exactly what heat your meat is at. The following are some important factors you have to keep in mind when purchasing your thermometer. The accuracy of your thermometer is going to either allow you to make the perfectly grilled medium rare steak or embarrass you as you explain why there won’t be meat for dinner. One way to check if you have an accurate measuring device is by doing the ice water check. Fill up a glass of water with ice cubes, letting it sit for a minute so some of the ice cubes melt. Insert the probe from the thermometer ensuring that the tip doesn’t touch the ice cubes directly or exceed past the ice cubes. The temperature your thermometer should read should be either 32o Fahrenheit or 0o Celsius. To get the perfect results from smoking, you want to make sure that the temperature remains constant throughout the cooking process. For this, look for a smoker thermometer that lets you set an alarm to notify if the temperature moves higher or lower than the programmed range. To further facilitate temperature monitoring, also make sure that the thermometer comes with a timer, Wi-Fi and a mobile app. One thing that often goes neglected, but is actually a very handy feature is when the thermometer displays both Fahrenheit and Celsius readings. Durability of a smoker thermometer is one feature that may be tied in directly to the product’s price tag. This is because the sturdier the materials used, the higher will be the manufacturing cost. As such, if you want your thermometer to last, you may have to look for a slightly expensive unit. Cheaper models use inferior quality materials and may not make the cut for durability and longevity. Most low to medium-end models will feature a single probe which is often sufficient to simply monitor the meat’s internal temperature. However, a dual probe thermometer will let you do this and monitor the temperature inside the grill all at the same time. Some higher end models may even feature four to six probes to allow you to monitor multiple types of meat simultaneously. They will also give you readings on the grill’s internal temperature. A waterproof thermometer allows you to use your thermometer in a more versatile manner. When you’re considering a thermometer, it doesn’t hurt to be on the safe side. There are times when there’s the possibility of rain or something getting spilt over the probe or display. When and if this does happen, having a waterproof thermometer ensures that you don’t have to worry about your thermometer getting damaged. It also serves more than the sole purpose of measuring the temperature of your grill now. You can measure the temperature of water to see the boiling point. For further convenience, people enjoy having a thermometer that has a wireless connection. This allows them to keep the display screen with them or connect directly to their phone, tablet or a receiver while the probes keep an eye out on your temperature. Users get the privilege of not having to stand over the grill while the food cooks. It does take time and you could be enjoying time with everyone else while the food prepares. A wireless connection to the thermometer can perform this action for you, which is a great bonus point. The one consideration here is to watch out for the range of the transmitter and how you receive the data. The ThermoPro starts their deal with a pleasing 1-year warranty upon purchase. If you register your thermometer upon your purchase, you can receive an extended three-year warranty with an inclusive free replacement probe if you encounter any issues. The ThermoPro comes with the transmitter and receiver pre-synchronized. All the unit requires upon purchase are batteries. The thermometer can send a signal to you if your heat levels increase or decrease too much. You can insert a set temperature range to follow and your thermometer will oblige. The radius of the thermometer monitor is 300 feet, so you can attend to other needs while the unit keeps a check on your food. The body is as promising as the performance. 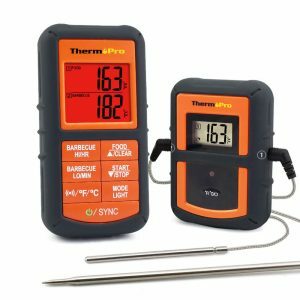 With a strong stainless steel build, this thermometer can take on the heat and some bustling about. You can even activate a timer on this piece for any additional food pieces you have in the grill that don’t need to sit as long as the meat. This thermometer can be used in the oven, for BBQs and smokers. This versatile unit will also alert you if you’ve lost the connection from your grill to your display screen. ThermoPro has multiple mount options including a belt clip or counter stand for the display and a wire to either hook onto the oven handle or use simply as a stand. An issue with this product though could be that when being used in heavier duty processes, it tends to lose its stable control. When used with multiple other transmitters, the receiver does have a hard time keeping up with the various temperatures. This leads it to show the wrong or inaccurate temperature which can prove a nuisance. Although this does occur, the transmitter’s own screen will show the correct temperature. This unit does tend to also misread the temperature after a few runs, hence the generous free probe you’re eligible to receive if you do encounter issues. ThermoPro is a robust and trustworthy unit for simple jobs such as a BBQ smoke or long-lasting oven jobs. It makes working in the kitchen more bearable since you don’t have to be in the kitchen the whole time. Mister Chefer provides you with a waterproof, mobile thermometer for your kitchen needs. This thermometer can read your temperature levels almost immediately with striking accuracy. This piece comes with many features for an appealing performance. For convenience, there is a hanging hole in the body to store this away when you’re not using it. The display screen is large and bright so the numbers come out clearly and quickly. It also has an LED night function for a bright resolution. This feature allows you to figure out the temperature and move away from the heat as soon as possible. The temperature reading takes a mere 2-3 seconds for a quicker response time. This unit can shift from Celsius to Fahrenheit for your preference. With the waterproof body, you don’t have to worry about water seeping through your thermometer. There is a magnet inside this piece, so you can place it conveniently on the refrigerator for whenever you need to use it. With a 10.6 inch reach (including the body), you can easily press the thermometer into multiple types of meat to get the exact temperature inside and out of the meat. This reach and waterproof build even allow you to check the temperature of beverages. The puncture of the probe is small enough to go unnoticed and let nothing seep out when you serve. As soon as you fold the probe back into place, the display screen and automatic features shut off to save battery life. If open but not in use for 10 minutes, the thermometer will automatically shut off. This thermometer is backed by a lifetime warranty along with a 100% guaranteed money-back policy. One issue with this thermometer is that the body is relatively delicate. When using it the plastic build does not resist the heat as well as a metal body would. This model Weber iGrill thermometer can handle up to four probes propped in different places at once. All the meat probes have resistance from heat up to 716o Fahrenheit or 380o Celsius. However, the primary purchase does come with only two probes. The transmitter has an LED display and can connect to your phone via Bluetooth connection. You can monitor the temperature of all your included working probes through your phone. The transmitter has a magnetic base, allowing you to prop it directly on the grill or oven for easier access. The transmitter has a 200-hour battery life for long-lasting and efficient performance. The app you can get off of the App Store or Google Play has pre-installed temperature settings and you can include your own specifications for your favorite dishes. In total, this app can handle up to five different transmitters all with four probes each. Just be careful for you may encounter a heavy load with these many probes in action all at once. The promised Bluetooth range is 150 feet, though buildings and other signals from other devices are entirely prone to interrupting this connection. 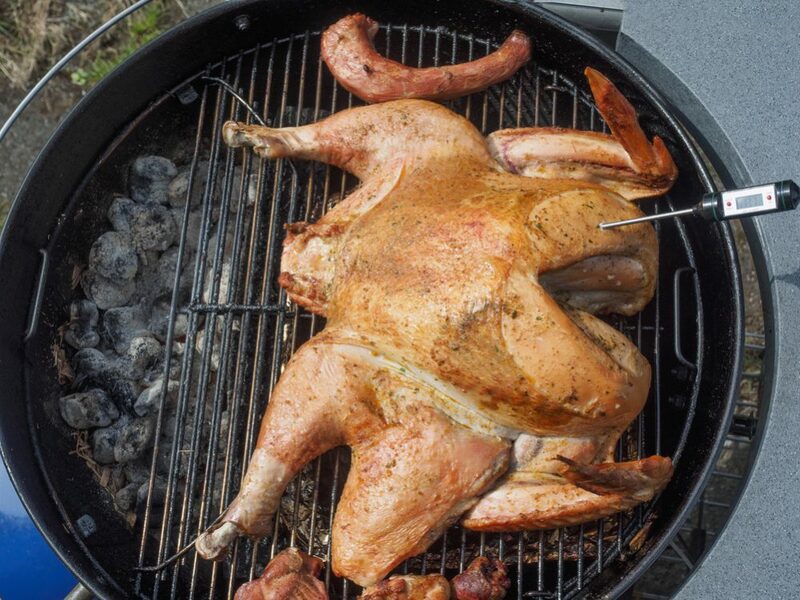 It’s better not to leave the grill or oven completely unattended. All the probes that can be connected to this transmitter are 4 feet in length, giving you a fair amount of distance from the heat source. Through the app, you can modify the temperature display, changing it from Celsius to Fahrenheit based on your preference. One downfall to this deal is that the Bluetooth does not always pull through to the 150 feet assured range. Doors and walls to tend to get in the way of the Bluetooth connection even if the transmitter has full batteries. Fortunately, you can still monitor the temperature directly from the transmitter as it does have the display screen controls to scroll through the four probes. This newer model from Weber comes with a sleek design and like the former, can handle up to four probes working at once. Once more, the probe wires can handle up to 716o Fahrenheit or 380o Celsius. Upon purchase, it comes with two probes. The temperature readings can be changed from the app between Celsius and Fahrenheit. This transmitter has a longer lifespan than the iGrill 2, with 250-hour battery life. The batteries are included in the primary purchase. This Weber device also works with an app to help you regulate the temperature from a distance, though there are some devices it cannot connect to. This includes the iPhone 4, iPad 1st and 2nd generation along with Huawei devices. The app can be found on the same platforms unless listed from the following. The biggest drawback about this device is that it is rather limited compared to the Weber iGrill 2. The first can be used with other grills, placed on anything metal and can serve over multiple devices so long as you could install the app. This one is shortened to less of a variety. It only mounts on Weber grills and cannot connect to some types of devices. The iGrill 3 does use the same probes though, so you can shift those from one device to another. It is four feet in length which is a fairly decent distance from the heat source. The Bluetooth connection, when compared to the iGrill 2, isn’t as good though. One noticeable drawback for this transmitter is that it permanently mounts onto grills made by Weber. The grills it’s compatible with the Weber Genesis II, Genesis II LX, and Spirit II. Using it on the stove, oven or other model grills is not possible. You may also like: 7 Best Charcoal and Propane Combo Grills – Which Dual Fuel Hybrid Grill Is Right for You? Rounding off this list, the NutriChef Thermometer comes off as the top contender for multiple reasons. It comes with a display screen transmitter that can connect to up to six probes. The range of its Bluetooth is 200 feet outside. This is divided in half when you use it indoors. However, it does only come with two probes in the primary purchase. You can apply your own modified timers and temperatures for your meats being monitored. When the time is over or the temperature is reached, you’ll get a push notification on your phone. Likewise, you can get an alarm if the heat decreases or increases significantly. The app connecting the transmitter and your phone can be used through Wi-Fi as well as Bluetooth for a strong, reliable connection. You can get this on either Google Play or the App Store. Coupled with an adjustable stand, the LCD display can be placed in plain sight if you are not connected through your phone. The display runs through all of the temperatures from each probe, showing them all routinely. The probe and wire are both readily made to handle high temperatures scaling up to 716o Fahrenheit. The probe cords are 32 inches in length, allowing you to keep your transmitter a fair distance away from the heat source. The probes read with a +1 to -1 Fahrenheit accuracy. This device is hassle-free and considerably fool-proof when it comes to making mistakes. All you need to do is insert the probes to the transmitter and meat and let the app tell you what is going on. What really exemplifies this product is the capability to withstand and endure the whole cooking period while still giving you all the convenience you need. If you want something to last as long as possible, it’s always better to keep it under maintenance. Luckily, a thermometer doesn’t require much maintenance. You can keep a thermometer in peak condition just by following a few pointers. Never leave your thermometer outside unattended. Whether or not manufacturers promise you that the device is waterproof, it’s always better to clean off and dry your thermometer as soon as possible. Leaving it out to get wet can cause rust to develop over it and this will render your thermometer useless. A good waterproof thermometer can handle a little water over the surface but not a complete abandonment to a wet environment. As soon as you find out your thermometer is wet, dry it off and check to see if it’s functioning properly. Keep the probe tips clean. This is the vital point of the thermometer. This is also the most used part of the thermometer and what you’ll stick into the meat and grill. This point is the most liable to develop a layer of carbon. If you allow a carbon layer to develop over the tip of the thermometer, you can get false readings for heat. The worst situation is when an opaque layer develops over the tip. Also, never submerge the probe to wash it. Instead, wipe it down with a paper towel as submerging it in water will cause the probe to fail. Never go over the temperature rating to compromise the unit’s performance integrity. This works well if you decide to slow cook something but for high heat, functions stay within the recommended temperatures. 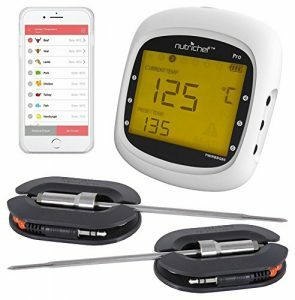 Once and for all, NutriChef Smart Bluetooth BBQ Grill Thermometer tops this list with its impeccable reliability and convenience. You can monitor up to 6 different meat pieces with the probes, while other products only offer you a maximum range of four. This device not only connects to your phone through Bluetooth, but through Wi-Fi as well for a stronger and steadier connection. You can personalize the timings, temperatures, and alarms. Get notified for when the temperature is too hot or cool and for when the time is up. NutriChef lets you move further away from the grill or oven than other options do and promises an accurate measurement each time.